Make this soup when you are feeling under the weather or just need a break from the general sodium overload of life. With the chicken, dried mushrooms, ginger, garlic and kombu you will still have a flavor packed, umami rich broth that you will want to drink by the mugful. In fact, you should most definitely have a mugful while you wait for the chicken to cool. There are no bonus points for burning your fingers while removing the meat from the carcass. The soup part of this recipe is for two. However, this recipe can easily be doubled to serve four. And tripled for six. You could skip making the broth and buy no salt added chicken broth, but this broth is the best part! If you prefer to use a different noodle, by all means, go ahead. Make the broth early in the day or the day before. Cut the wings off of your chicken. Separate the tip, the flat and the drumette. Click here for some basic wing anatomy. Start filtering water and pouring it into a pitcher or large bowl. If you don’t drink water straight from the tap at your house, why cook with it? Remove the gizzards if they are in the cavity. Rinse the chicken. Rinse the Swiss Chard. Slice out the stem (we aren’t using it in this recipe). 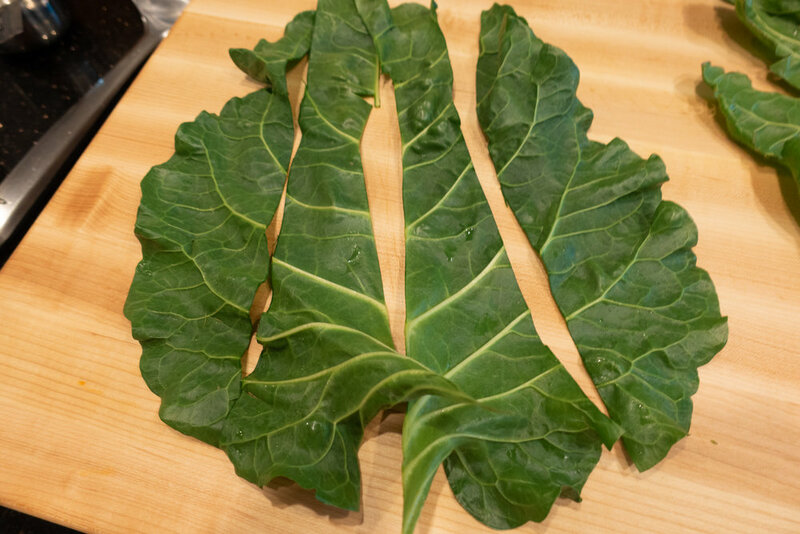 Slice the leaves into roughly 2” long and 1" wide slices. Heat up a large pot over medium high heat. Add a splash of grapeseed oil. Add the eight chicken wing pieces (the four you bought and the four from your chicken) to brown. After seven minutes, flip the wings and cook the other side for five minutes. 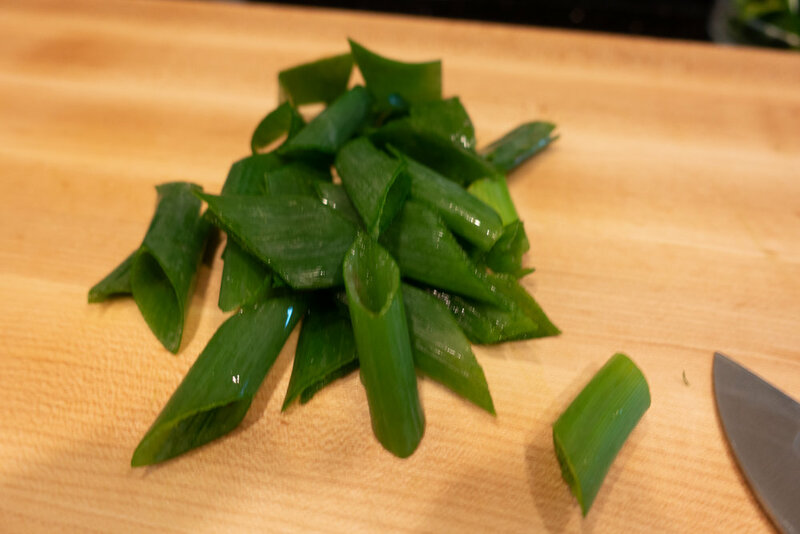 Smash the garlic cloves with the flat side of your knife. Discard the garlic skins. Add the garlic and the sliced ginger to the pot and stir. Cook for two minutes. Add the mushrooms, kombu, scallions (white & light green parts only), chicken and water. Add enough water to cover the chicken. Increase heat to high and bring to a boil. Cover and simmer until the chicken is cooked through. This will take roughly an hour but will depend on the side of your chicken. Remove the chicken. Then increase heat to high and boil for five minutes covered. Then remove the lid and boil for 10 more minutes. Make sure it doesn’t boil over! Strain the stock into a large bowl. Wait at least an hour for the chicken to cool. 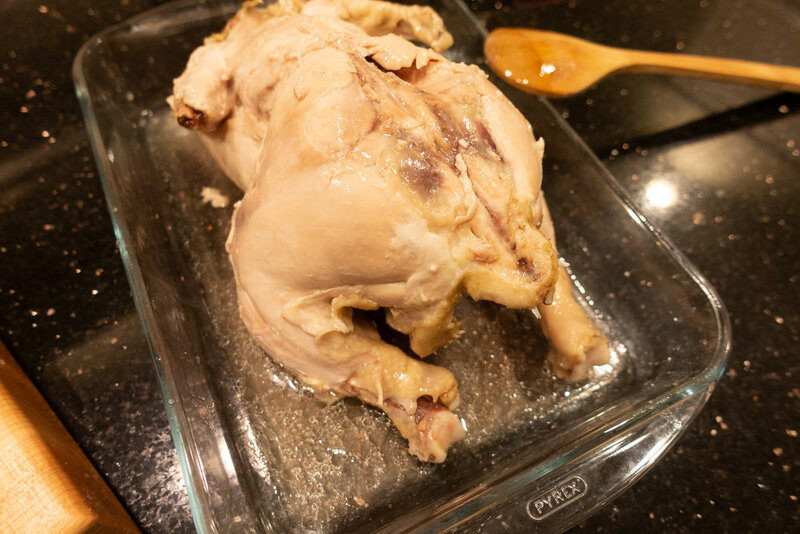 Once the chicken has cooled, remove the skin. Then remove the meat from the carcass and bones. Pour any accumulated juices into the bowl with the broth. We need two pots, one for the broth and one for the noodles. Add water to your noodle pot and heat over high heat. Add your broth to another pot, cover, and heat over high heat. When broth boils, reduce heat to low. When the pasta water is boiling, cook noodles according to the directions on the package. Then strain the noodles and distribute them evenly among two bowls. Add Swiss chard to the broth. Stir, cover, and increase the heat to medium. After 1 minute, add the sliced chicken and stir. After another minute, add the sliced scallion and stir. Then ladle the soup over the noodles.